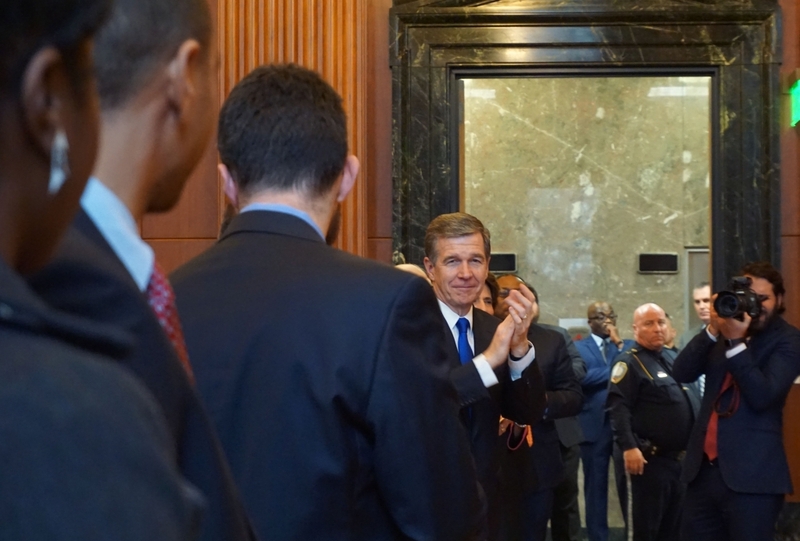 The newest state Supreme Court Justice Anita Earls had a swearing in ceremony Thursday afternoon that drew a crowd of North Carolina’s biggest movers and shakers in both the legal and legislative world. Earls wore a classic black skirt suit with an airy white blouse and a shiny gold and silver floral broach pinned onto the middle of her collar. 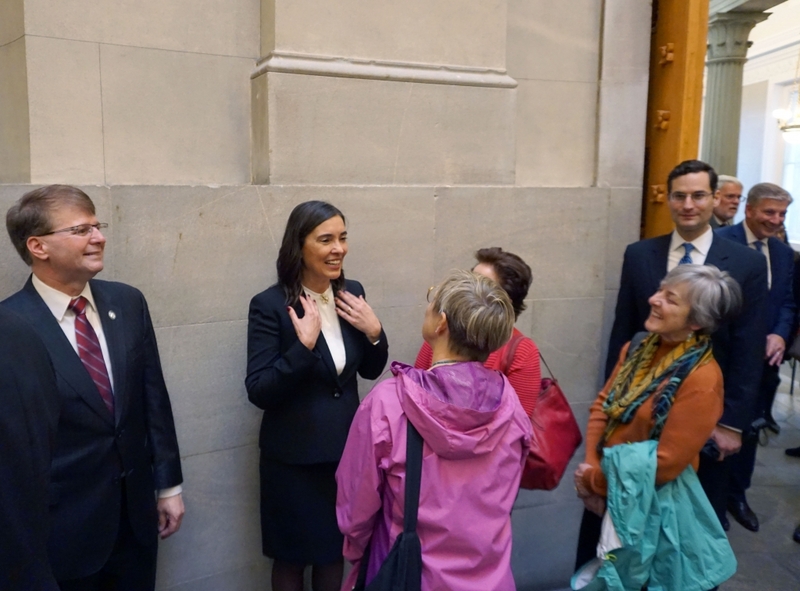 She had the state Supreme Court seal pinned to her lapel. 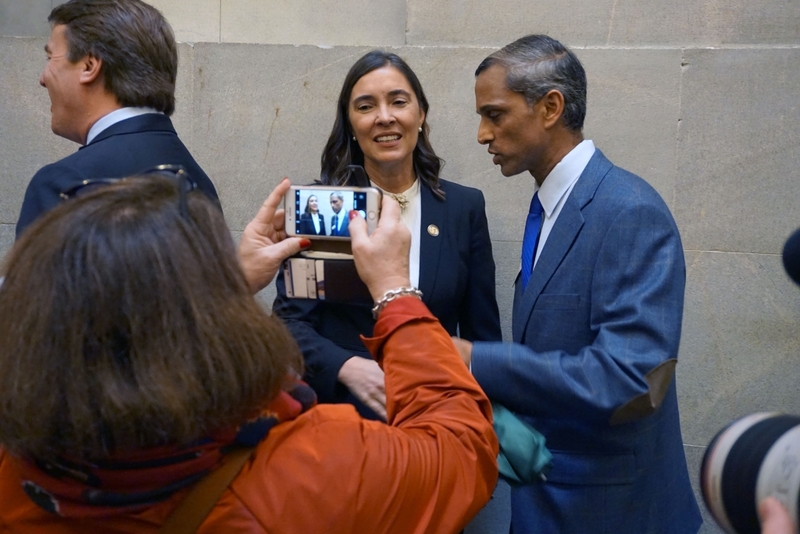 Her big smile was shining; her happiness oozed, and the hugs she gave the people in the room were genuine — it was not the state many are used to seeing her in, particularly in the courtroom. As an attorney, Earls was always the epitome of buttoned up and professional, remaining cool, calm and collected even during what could be perceived as intimidating moments. 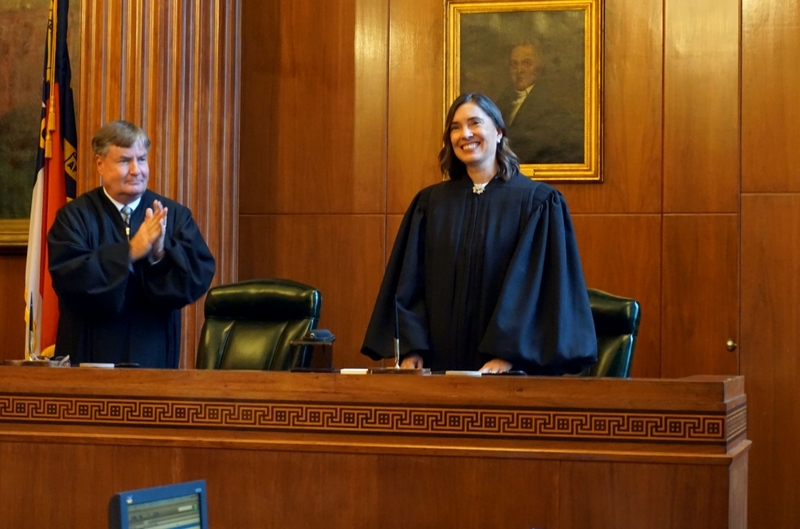 Her ceremony attendance list was a long one; more than 300 people RSVP’d to the event, and there were at least three run-off rooms for the crowds that could’t make it to the main Supreme Court courtroom. 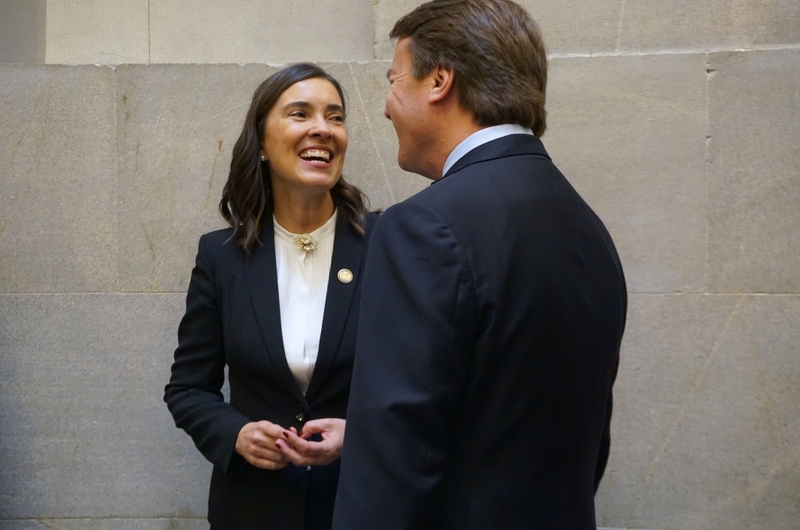 Attendees included John Edwards, Attorney General Josh Stein, former Chief Justices Henry Frye and Sarah Parker, Gov. Roy Cooper, Patricia Timmons-Goodson, Federal Judge James Wynn, former Justices Bob Edmunds and Bob Orr and many, many legislators. Per tradition, Barbara Jackson, who lost the race in the midterm to Earls, did not attend the event. 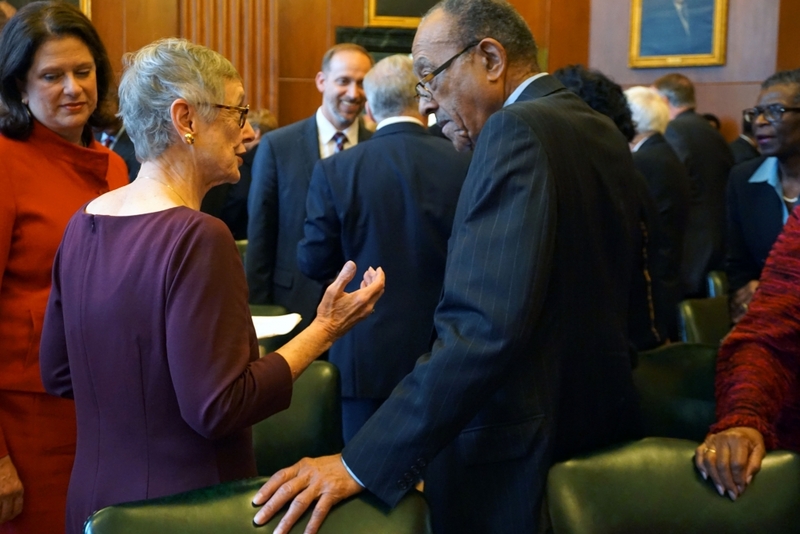 Earls was described by colleagues and friends at the event as esteemed, incredibly hard working and wholly devoted to equal access to justice, and they put their full faith in her. Her election tips the Supreme Court to a 5-2 Democratic majority. She has a prestigious background with varied experience and is known prominently for her civil rights work. She also founded the Southern Coalition for Social Justice (SCSJ), of which Kareem Crayton is now the interim director. Earls, who is the 100th Supreme Court justice, vowed to pull through on her promises to the state. She also spoke about why the job is so important to her. She feared her family would be torn apart, and believed she had to bring everyone together to show shared humanity and guarantee equal opportunities for all. Why was it necessary to describe what Justice Earls was wearing? Her qualifications and experience are why she was elected. It’s 2019, I thought we’d gone past defining women by their appearance or their clothes, but I apparently we haven’t. I’m disappointed. In an otherwise respectful and celebratory commentary on Anita Earls’ swearing-in ceremony, there was a lengthy and puzzling description of Justice Earls’ airy white blouse, shiny jewelry, shining big smile, and happiness that oozed. So, why not a review of John Edward’s impeccably tailored suit, boyish good looks, and $400 coiffure? I agree with the commenters that leading off with a description of Justice Earls’ clothing was inappropriate. Whether the author intended to distract from Justice Earls’ background, it did exactly that. I found it demeaning, infuriating, lazy, and embarrassing, all the more so because of the placement and amount of time devoted to her appearance. Meanwhile, her incredible record of public service and advocacy as a lawyers for 30+ years was reduced to “She has a prestigious background with varied experience and is known prominently for her civil rights work. 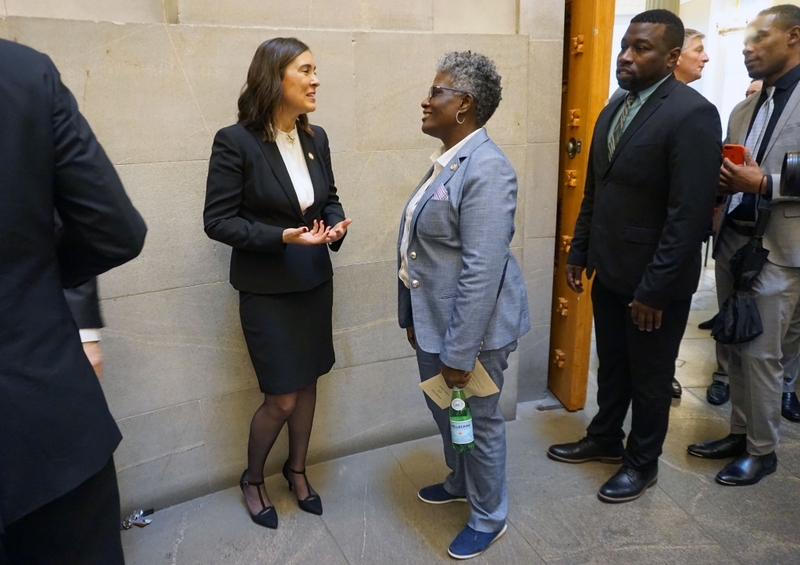 She also founded the Southern Coalition for Social Justice (SCSJ).” As to the articles about men’s clothing, Larry Hall talked about his clothing at the event and his “Marine red” jacket was related to his ascendancy to the post of Cabinet Secretary for Veterans Affairs. Given the history of media focus on women’s bodies and appearance, seems to me we should be careful about writing about it, even if there is occasionally some mention of some guy in a starched shirt. It would have been easy enough to talk about Justice Earls’ joy and beaming face w/o going into her jewelry, etc. Also, weird not to identify Samuel J. Ervin, IV as the “clapping justice” or to refer to John Edwards as a former Senator. I’m an old white guy, liberal as all get out, former Vietnam War protester, participant in the 1968 Poor People’s March, first male feminist I ever knew, former alt weekly editor and columnist, blahblahblah, so I qualify as a member of this site’s regular readership. OK, so there. 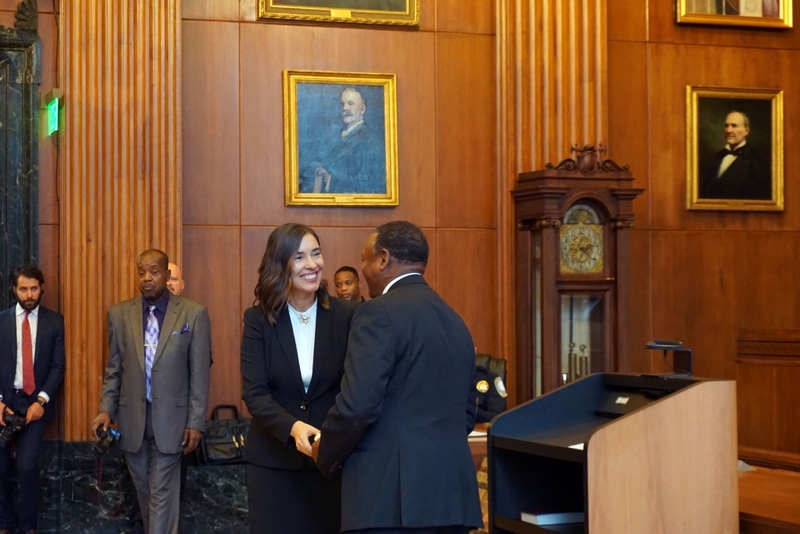 I want to say I agree completely with the complaints here regarding the highlighting of Judge Earls’ attire at her swearing in ceremony. In fact my initial, instinctive reaction to the description was “WTH is this, an article from Redbook magazine”? Luckily, the story got down to business later but wow, Not the needed intro.